I have been working very hard this past month to get my office/sewing room/creative work space a big makeover! I am so excited to be in the “putting it all together” stage now! There will be a post coming soon of the before and after photos. I just love how it looks and it is so functional for my needs to design newborn photography props! In the meantime, here is a sneak peak into an area of my space that I have turned into my children’s craft/drawing area. 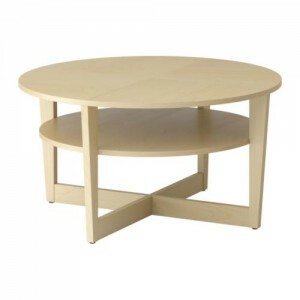 I could not find a round children’s table that suited the look I was after or was big enough for what I wanted. So I ended up doing a little Ikea Hack on the Vejmon Coffee table! It was the perfect diameter and height but it had a second shelf underneath the table top. I liked it but my children would not be able to get their knees under the table. So I simply just left the lower shelf out when I assembled it! I was concerned about it being wobbly but it is just fine and sturdy!! LOVE! So I had the table with the look I wanted but was concerned how the laminate top would wear to paint, water, glue, markers etc. 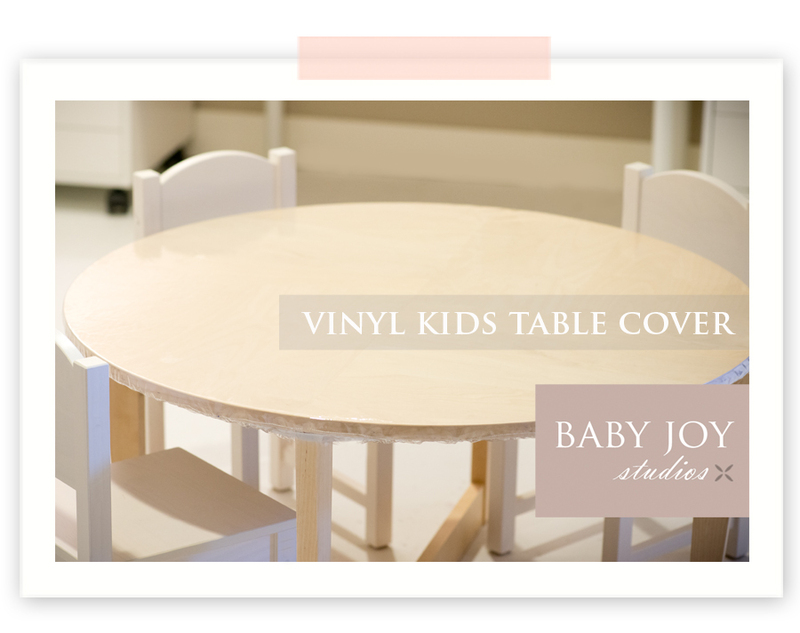 So next came a removable vinyl table top cover! Lay the vinyl on a hard floor surface. Turn the table upside down. Take a ruler and measure 3″ from the edge of table. Make a dot marking with a sharpie every couple of inches all the way around the table. 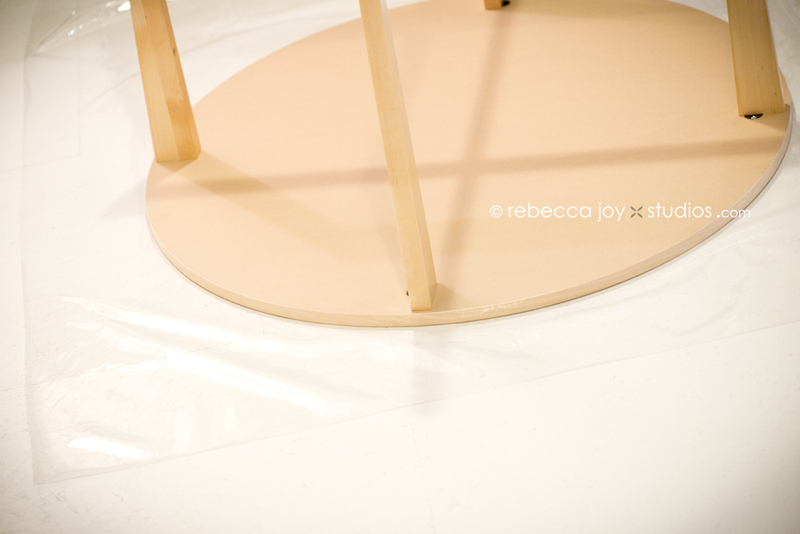 This will make a dotted circle 3″ wider then the actual table to make a template to cut the vinyl. Cut the vinyl with scissors following the dotted line you have measured out. Fold the vinyl over about 2″ to make a casing. Use straight pins to pin it. You will have to make and pin down little pleats in the vinyl as you go around. Sew the casing all around. I used a regular needle and white thread. Make sure to leave a 1.5 ” opening. Secure the end of elastic to a large safety pin. Here is the hard part! Push pin and elastic through the opening and all around back and out of the opening. Fit the cover over the table. Pull the elastic as tight as you can so the cover is snug over the edge of the table. Tie the two ends in a double knot and trim the ends. Push the elastic into the casing and sew the opening shut. Here is what your finished cover looks like completed! Now stretch it back over the table and voila! You are finished! As soon I was finished my children promptly covered the table with glue, glitter, ribbon, paper etc! I sat back and enjoyed watching them make art knowing their new craft table was protected! So easy to clean with a damp cloth too! Shop newborn photography props, knit hats, bonnets, headbands, wraps, mini blankets and more at Baby Joy Studios.